RVA offers numerous vacation rentals on or near the beautiful quartz-crystal, white sands of Siesta Beach. The Beach Club is a great addition to our existing inventory and is sure to set a new standard of accommodations and service on Siesta Key. RVA, one of the area’s leading vacation rental property management companies of vacation condominiums and home rentals, has been named property and resort manager of The Beach Club, located on Siesta Key, Florida. The Beach Club at Siesta Key is decorated in eye-pleasing neutral tones; each unit has a splash of green and turquoise – perfectly coordinating with the striking hues of the Gulf of Mexico. The Beach Club offers studio, one- and two-bedroom units, just steps from the Siesta Key beaches. Each unit features a full-size kitchen with stainless-steel appliances, private washer and dryer, large flat-screen LCD TV’s and iPod docking stations. The property boasts beach access just steps away as well as a heated swimming pool and hot tub. To inquire or make reservations for The Beach Club, 6732 Sarasea Circle, Siesta Key, FL, call (800) 237-9505 or visit http://www.beachclubatsiestakey.com. RVA Siesta Key offers numerous homes, condominiums and resort-style properties on or near Siesta Key beaches. Other RVA vacation rentals include: Sarasota, Longboat Key, Lido Key, Anna Maria Island and Venice. 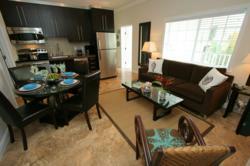 Each vacation rental is fully furnished and vacation ready. For more information log onto http://www.rvafl.com or call 800-237-9505. RVA a ResortQuest® Affiliate, is one of the nation’s leading vacation rental companies in Southwest Florida. RVA is the largest management company of vacation condominiums, homes and resort-style properties on Florida’s west coast, based on a portfolio of over 300 units. The Southwest Florida inventory includes premier beach destinations like: Anna Maria Island, Bradenton, Longboat Key, Lido Key, Sarasota, Siesta Key and Venice.